The Single Leg Reach is a balance exercise from the Exercise for Better Bones program specifically designed for the Athletic Level. This is the single leg reach balance exercise. Transfer all your weight onto one leg and you’re going to reach with your heel as you squat down. 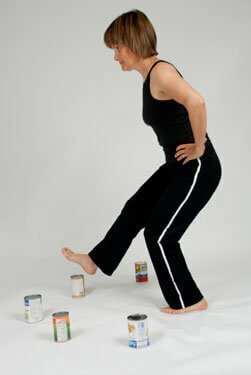 Remember with your squat to your kneecap over your second toe. Your heel is coming just above the cone, or the can, whatever you choose to use. Transfer and for a bigger challenge you would place your cones or your cans a little further apart and then reach out, back to the center. Reach out, back to the center. You can go across, as long as you don’t compromise your position. Check the chairs, then you can place your hands on your hips, I’m going to widen the cones a little bit, increase the challenge. That’s going to put me to go into a deeper squat, so I’m reaching the deeper level. It’s going to require more control both in terms of strength and balance. Then I get the added benefit of all that nice floating through the hip. And that’s the single leg reach for balance exercise. Exercise for Better Bones is an exercise osteoporosis program designed for people like you. It is available for purchase at Amazon in printed book and Kindle formats. It provides a safe and effective means to strengthen bone, reduce fracture risk, and build confidence.